TOKYO - U.S. stock futures and Asian share markets tumbled on Tuesday, while the yen jumped to four-month highs against the dollar after North Korea fired a missile over northern Japan, fuelling worries of fresh tension between Washington and Pyongyang. S&P mini futures ESc1 fell as much as 0.85 percent on the news before paring losses a tad to trade 0.65 percent below its close on Monday, when it was little changed as investors tried to assess the fallout from Tropical Storm Harvey. Japan’s Nikkei .N225 fell 0.9 percent to four-month low at one point while South Korea’s Kospi .KS11 shed as much as 1.6 percent, helping to drag down MSCI’s broadest index of Asia-Pacific shares outside Japan .MIAPJ0000PUS 0.7 percent. North Korea fired a missile early on Tuesday that flew over Japan and landed in the Pacific waters about 1,180 kilometers (735 miles) off the northern region of Hokkaido, in a sharp escalation of tensions on the Korean peninsula. North Korea has conducted dozens of ballistic missile tests under young leader Kim Jong-Un, but firing projectiles over mainland Japan is its first since 2009. “The missile flew across Japan this time, so the implications will likely be a bit different from previous ones,” said Hirokazu Kabeya, chief global strategist at Daiwa Securities. North Korea threatened earlier this month to fire missiles into the sea near the U.S. Pacific territory of Guam, a host to major U.S. military installations, after President Donald Trump warned Pyongyang would face “fire and fury” if it threatened the United States. The yen rose 0.8 percent to 108.33 to the dollar, its highest since April, despite Japan’s proximity to North Korea, and last stood at 108.79. The safe-haven Swiss franc hit a one-month high of 0.9498 franc to the dollar and last traded at 0.9523 franc on the dollar CHF=, up 0.3 percent. The Swiss currency gained 0.4 percent versus the euro to 1.1396 per euro. The euro hit a its 2 1/2-year high of $1.1986 and last stood at $1.1970 EUR=, maintaining its uptrend after European Central Bank chief Mario Draghi did not express concern about the currency’s recent rise in his speech at Jackson Hole. Gold XAU= also jumped 0.9 percent to $1,324 per ounce, hitting its highest level since Nov 9. Investors also rushed to the safety of U.S. Treasuries, pushing down the 10-year yield to a two-month low of 2.124 percent US10YT=RR. On the other hand, the South Korean won KRW= retreated 0.8 percent against the dollar to 1,127 won. 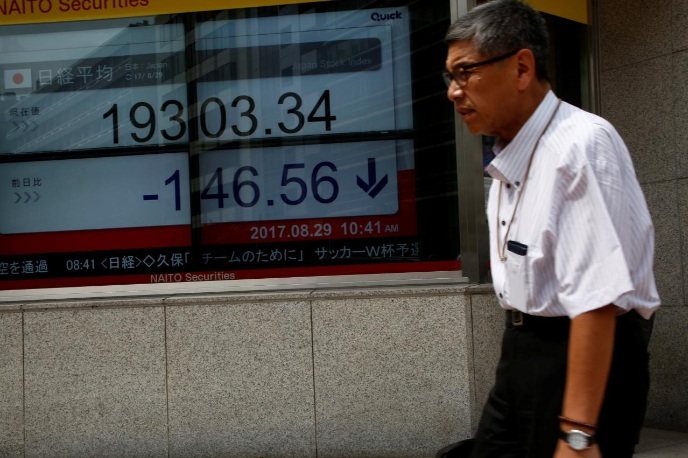 “Financial markets think the only realistic option for the U.S. and North Korea will be to sit down and talk at some point because other options are too costly for everyone involved,” said Masayoshi Kichikawa, chief strategist at Sumitomo Mitsui Asset Management. “But no one cannot rule out the risk of accidents. Markets think the chicken game will continue for now and North Korea will remain a risk,” he added. Investors are also looking to how Trump will react to North Korea, and to his push for tax reforms. He is expected to begin a major effort this week to convince the public of the need for them. On Monday, U.S. shares were narrowly mixed as investors tried to assess the flooding damage caused by Tropical Storm Harvey, the powerful hurricane to strike Texas in more than 50 years. Crude oil prices bounced back a tad on the back of supply disruptions in Colombia and Libya, a day after U.S. crude futures CLc1 dropped on worries that refinery shutdowns caused by to the flooding could boost inventory. U.S. West Texas Intermediate (WTI) crude futures CLc1 rose 23 cents, or 0.5 percent, to $46.80 a barrel, after having falling to as low as $46.15 in the previous session. U.S. gasoline price RBc1, which surged as much as 7 percent to a two-year peak of $1.7799 per gallon on Monday, traded at $1.7317 in early Tuesday trade.